Oxford Univ. Press for the Trustees of the British Museum, London: 1915. Folio. 16pp. 50 collotype plates of medals. 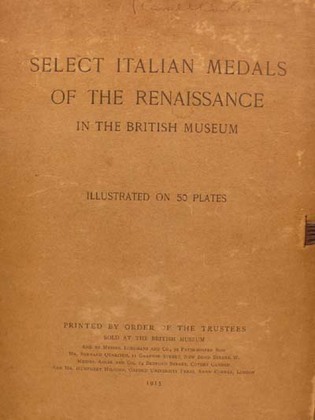 Scarce collection of plates of the famous collection of the Italian Renaissance medals in the British Museum. Sir G.F. Hill (1867-1948) was the foremost scholar of medals of the twentieth century.